Get your camera ready for a great photo opportunities! Are you ready for getting chance to win prizes and luxury hotel offers, with a total prize pool over MOP 50,000.00? 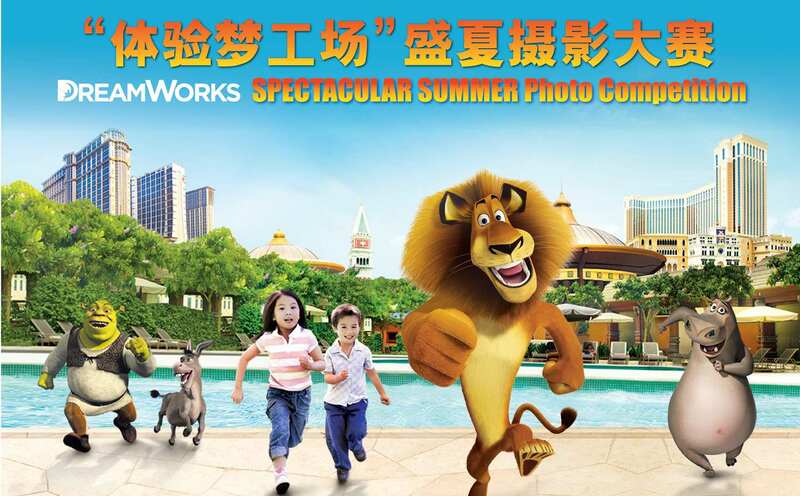 Now just upload your photo taken during the DreamWorks Spectacular Summer period to our official activity website! Voting prizes are ready for non applicant too, how can you missed a chance of winning a complimentary DreamWorks Experience luxury hotel stay with your favorite buddies from DreamWorks Gang. 1) Winner (x1): winner will receive One-night stay in Holiday Inn Macao, Cotai Central Premier Suite for 2, Shopping Voucher cost 3,000 MOP, DreamWorks Experience Birthday Parties Package cost 7,500MOP, One-way Cotai Water Jet Cotai Class Ferry Vouchers for 2 and DreamWorks Plush Toy. 2) Second Winner (x3): each of the winners will receive One-night stay in Holiday Inn Macao, Cotai Central for 2, Shopping Voucher cost 1,500 MOP, Shrekfast Character Breakfast for 2, One-way Cotai Water Jet Cotai Class Ferry Vouchers for 2 and Plush Toy. 3) Third Winner (x5): each of the winners will receive Shopping Voucher cost 800 MOP, Shrekfast Character Breakfast for 2, One-way Cotai Water Jet Cotai Class Ferry Vouchers for 2and Plush Toy. 4) Awards of Merit (x10): each of the winners will receive Shopping Voucher cost 300 MOP, Shrekfast Character Breakfast for 2, One-way Cotai Water Jet Cotai Class Ferry Vouchers for 2 and Plush Toy. 6) Best Support Award (x3): each of the winners will receive One-night stay in Holiday Inn Macao, Cotai Central for 2, Shopping Voucher cost 300 MOP and Shrekfast Character Breakfast for 2.